Griddles are a type of range with a flat top, allowing for even heat distribution which makes it ideal for cooking items directly on the surface. These types can be placed on a worktable or above another cooking unit and are easy to move (provided the necessary utility connections and ventilation requirements are met). 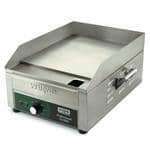 Best for the small griddle, usage small, kitchens. While the griddle surface still is at an accessible height, the unit itself is supported with steel legs in order to have a footprint. These typically come with shelving or drawers underneath to allow for better space usage. Griddles on top of ranges or refrigerated drawer bases are also very popular. 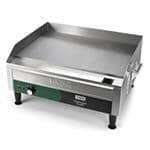 Best for restaurants with heavier griddle usage, kitchens able to sacrifice floor space. Placed into a cutout section of a work table or other flat surface, drop-in griddles are aesthetically-pleasing and best suited for kitchens looking for consistently flat surfaces. Best for front-of-house and flat countertop surfaces. Drop-in units best suited for Japanese-style hibachi. While similar to drop-ins, the heat for these griddles is only in the middle, allowing the user to push foods to the edges for cooling purposes. Best for hibachi grills, Japanese restaurants. Steel: this durable option is the traditional choice for griddle tops, as it works well in most applications. Chrome: simple to clean, these surfaces can feature an easy-release, making them ideal for delicate items like eggs. They also have better heat retention and consume fewer BTUs but can be costly in the initial investment. These controls allow the user to set the griddle at an exact temperature, making them more ideal for delicate items. Best for eggs, pancakes, delicate items, breakfast foods. Griddles are a type of range with a flat top, allowing for even heat distribution which makes it ideal for cooking items directly on the surface..
Rather than utilizing specific temperatures, manual controls allow the user to set the griddle to ranges (low, medium, high). As the plate amasses heat, control may need to be adjusted. Best for burgers, bacon, cheesesteaks, other meats. Hood Size: Your hood will need to be six inches larger on all sides than the measurements of your griddle. If your griddle is part of a grouping of equipment, then consider the group as a whole as your minimum measurement for sizing your hood appropriatey. Cooking Zones: If your restaurant cooks both breakfast and lunch items on the griddle, then you may want to consider a griddle with different cooking zones (or two separate griddles). This way you can cook delicate breakfast items alongside tougher meats without overcooking or undercooking items because of the singular cooking temperature. How the heating elements are arranged under the griddle will determine if you may have “hot spots” or cooler areas. Also, consider the level of control across the complete hot plate. You may want an area to place product for slower cooking or to keep warm. Or if you are cooking different products, you may want different temperatures across the griddle.